Did you telephone Flight Service to cancel your VFR flight plan after arriving at Fairchild, or is the Civil Air Patrol now out there flying search patterns on your behalf? 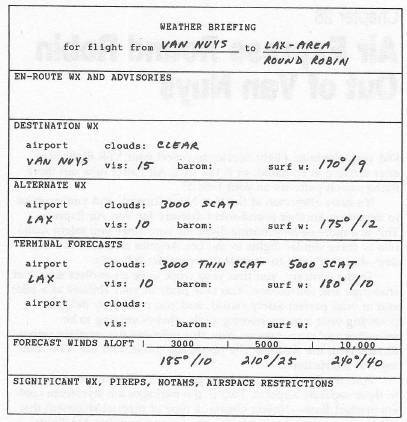 It's early afternoon at the Van Nuys Airport, and you're about to depart on another round-robin delivery for Van Air Express. This is a more-or-less routine flight for you, since you might make two or three similar flights in the Los Angeles area almost every day—but that's not to suggest you consider it boring. To the contrary, you find your work to be an endless source of challenge and satisfaction. You take pride in your abilities as a pilot and in your perfect safety record, and you constantly delight in polishing your various piloting skills, always striving to be smoother and more precise. You also welcome the constant unpredictability of the weather, the prevailing traffic, and the ATC routing and instructions. Four Six Fox is now ready to go, with rush items for delivery to three separate airports. Two of the packages are styrofoam coolers marked Rush—Human Organs, a type of medical shipment that has become increasingly familiar to you on your Van Air flights (though you prefer not to know their exact contents). Since you know the L.A. area like the palm of your hand, and since your flights are invariably short, you usually find it unnecessary to prepare a formal log. You don't hesitate to file IFR when the weather requires, of course, but today it's fairly clear. You therefore take off VFR, knowing you can easily file IFR en route if that seems advisable. The weather presents no special problems, but since there's plenty of moisture in the air, it's likely you'll encounter clouds or poor visibility on at least one leg of the flight. Your first stop is Compton, just a few miles east of Los Angeles International. For that leg, you first circle around well east of the airport, staying low to avoid LAX traffic. Since Hawthorne and Torrence are also in the same locale, you usually set your ADF for the Compton NDB just to be sure you don't end up landing at the wrong field. A wrong landing isn't at all difficult to do, especially when there's haze or smog; even scheduled airliners have made that kind of mistake. The second stop is the private field on Catalina, for which you have landing permission today. On departing Compton, you again want to steer clear of LAX traffic; then you home on the Catalina VOR. Your only concern is to remember that the runway at Catalina is particularly short and narrow. Stop number three is Corona. From Catalina you can first home on the Santa Ana VOR and then on the Paradise VOR, which is about three miles east of Corona Municipal. From Corona, you just head directly back to Van Nuys. Van Nuys Ground, Cessna Three Zero Four Six Foxtrot, VFR to Compton, ready to taxi. Then turn right onto 16 Left. You move ahead, turn right, and taxi along the inactive runway. On one one niner point three so long. You set Nav 1 on Los Angeles and use the DME to fly a wide arc around LAX, remaining at 2000 feet. The airport is uncontrolled. You do a straight-in cross-wind landing. You turn off to the right and park at the FBO office to drop your delivery. Once someone has signed for your parcel, you taxi back the way you came and depart on the same runway where you landed. While climbing to 3000 feet, you turn toward the south, tune in Catalina, and home on that VOR. The surface wind is from the south, so you fly a conventional lefthand pattern to land into the wind. At the end of the runway, you pull off to the right and turn your parcel over to the waiting attendant. Once someone has signed for your parcel, you taxi back the way you came and depart. While climbing to 3000 feet, you tune in Santa Ana and turn to home on that VOR. You notice a lower level of clouds just ahead, so you can soon expect to be trapped between layers. 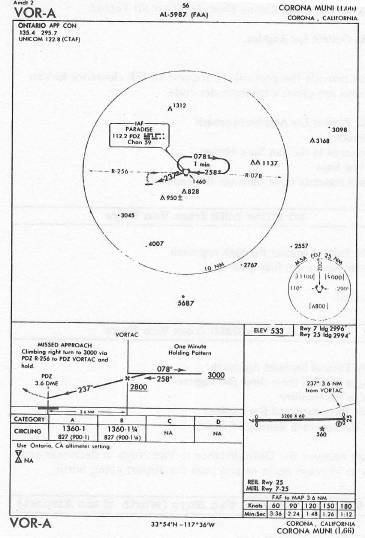 Accordingly, you call Coast Approach on 121.3 to request an IFR clearance. Coast Approach, Cessna Three Zero Four Six Foxtrot. Four Six Foxtrot Coast Approach go ahead. Coast, Four Six Foxtrot, we're a Skylane, VFR at three thousand, ten miles east of Santa Ana, en route from Catalina to Corona Municipal, and it looks like we'll be coming in between layers here in a few minutes, request an IFR clearance to Corona, we're instrument rated and equipped, and we're cruising at one two zero knots. Four Six Foxtrot Squawk one one zero five. On one three five point four so long. And expect a probable hold at Paradise. Expect the VOR-A approach to Corona Municipal. The Ontario altimeter is three zero point zero five. Ontario Approach, Four Six Foxtrot has the airport, and we'll cancel IFR at this time, thanks very much. You turn off to the right and make your final delivery, noticing that the sky has completely cleared. When ready, you taxi back the way you came and depart VFR. While climbing to 3000 feet, you tune in Van Nuys and turn to home on that VOR. You notice another cloud bank ahead, up toward Van Nuys. Los Angeles Approach, Cessna Three Zero Four Six Foxtrot. Four Six Foxtrot Los Angeles. You provide the particulars, request an IFR clearance to Van Nuys, and are given a transponder code. Climb and maintain three thousand five hundred. On one two zero point four good day. Expect ILS approach Runway 16 Right. You monitor the DME distance to Van Nuys: It decreases and begins to increase again as you pass the airport going north. You're cleared to taxi to Van Air Express.